We live in a time of upheaval. Many in our society—and all over the globe—sense that the world as we’ve known it is changing rapidly; much that we once took for granted is no longer stable. From our financial, educational, and governmental institutions to our local communities and even family relationships, there are signs of cultural breakdown on every hand. With a sense of despair, many ask, “How can I find hope in such a troubled world?” Of course, the problem isn’t just societal: it’s personal. Each of us faces difficulties and pain. From the loss of a job to the death of a loved one, many experiences leave us searching for hope. Simply put, hope is a universal human need. In our modern vernacular, we’ve all used the word hope in the sense of “wish,” something we’d like to see happen but that is really outside our power to control or influence. But such wishful thinking cannot sustain any of us. Instead, we need something grounded in reality. We need hope in its older sense; that is, a confident expectation. The Bible teaches that the universal need for hope is answered by God with His universal source of hope, His own promise to save and renew all things. From the very beginning, when Adam and Eve’s disobedience plunged the world into chaos, God made a promise of deliverance (Genesis 3:15). This hope of deliverance has sustained God’s people throughout the long ages since. In the unfolding of God’s plan, God called Abraham out of the darkness—and hopelessness—of a pagan land and promised Abraham a blessing, not only to himself, but to “all families of the earth” through his own descendent (Genesis 12:1-3). Generations later, when Abraham’s family had flourished into a nation, God promised Israel’s greatest king, David, that a son of his own would rule forever in a kingdom of peace and would build a house for God’s name (2 Samuel 7:1-17). Who is this promised Hope? The very Jesus of Nazareth, the descendant of Abraham through Whom blessing flows to all nations! Jesus, the Son of David, who is building a house for God’s Name! This “house” is no physical structure but is the new community, the new society that comprises people from every ethnicity, social status, and nation. You see, God’s answer to humanity’s need for hope is that He, Himself, will make all things new through His Son, Jesus. You may be thinking, “Well, I don't belong to that community. I'm not religious.” Or perhaps you believe that the Christian faith is only for the “right kind” of people. Nothing could be further from the truth. The salvation that God extends in Jesus is free for all who will trust in Him. You are not excluded from this offer. Whoever you are, whatever you have done, you are not beyond God’s ability to save. The hope that God offers has always been and will always be in His own power to save. At Thetford Baptist Church, we cling to the hope—the confident expectation—that, just as God has been faithful to His promises so far, He will continue to keep His promises in the future. This hope has no basis in ourselves or in impersonal forces like fate or destiny. 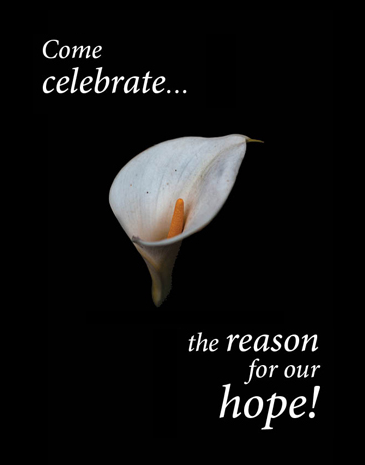 Our hope is in God. 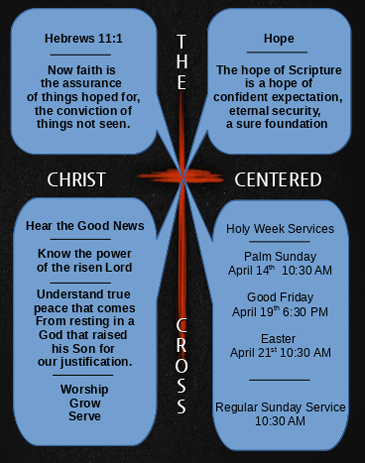 Won’t you come worship with us to learn more about the reason for our hope?